When Alan Holtham reviewed the Bosch combo GOF 1600CE router recently he gave full marks to what seemed to me to be a very well detailed and considered design containing many safety features. 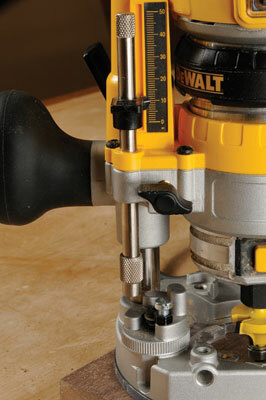 DeWalt has now produced a similar machine on a smaller scale. It's very neat and compact, having two bases and one motor. 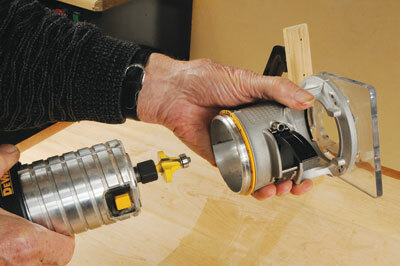 The motor is small enough to be gripped and held in one hand, like an edge-trimming router. 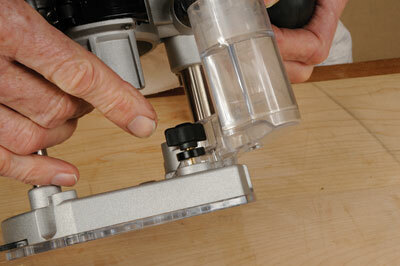 The fixed base carries the motor when the router is in the storage box so this was the obvious part to try first. The motor is clamped into either base section by a horizontal locking lever, requiring only a simple flick to release it. The fixed base also has two small catches on the adjusting ring that need to be released to remove the motor. With the motor removed it's easy to fit a cutter into the collet using the spring-loaded spindle lock and the spanner provided. 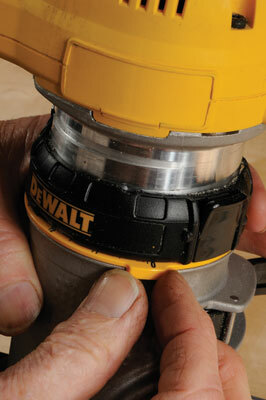 I chose a 1/4in radius cutter with a bearing guide and by turning the adjusting ring, set it to depth. The stop/start switch is mounted near the top of the motor, under a clear plastic dustproof cover and is rather small and difficult to operate. 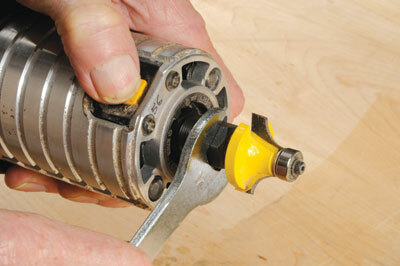 The soft-start motor is smooth and surprisingly quiet for a router. Speed is controlled by a rotary wheel above the switch. The same switch turns on the dual LED lights but only when the motor is running. The fixed base doesn't have handles so you have to hold it by the motor, not the safest thing to do with the cutter sticking out of the bottom. 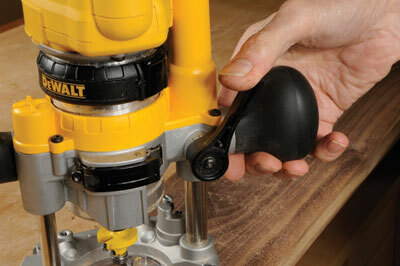 I felt nervous holding it with the motor running and no cut-out to rely on in an emergency. In fact if you accidentally left the switch turned on, the motor would start up as soon as the power was connected. Both of these bases have clear polycarbonate plastic faces to allow the light to reach the work and afford a better view. The plunge base is also the same shape and size as that of the MOF96. Strangely there are two fences with this router, one normal fence held on two rods using the same centre size as the old Elu MOF 96 and one simple pressed-steel fence that fits both bases. I tried the pressed-steel fence and found it easy to use and adjust with the single wing nut. 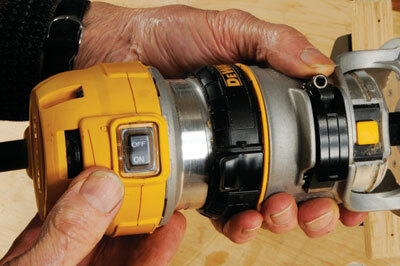 The clear polycarbonate dust extraction collectors will accept two hose sizes. A little fiddly to fit, they worked satisfactorily once in position. An improved depth stop with a sliding pointer and a fine-adjustment knurled piece where it meets the usual 5-turret stop was a delight to use. The plunge mechanism is controlled by a sprung locking lever. Press the lever and the action is released, let go and it automatically locks at the depth required in a smooth action that reduces the risk of presenting the cutter too quickly to the material. The supplied standard 17mm- diameter guidebush will only fit into the plunge base with two small screws as in the past.